Is there a princess in your life that needs some perfect princess pampering? This episode is for you! 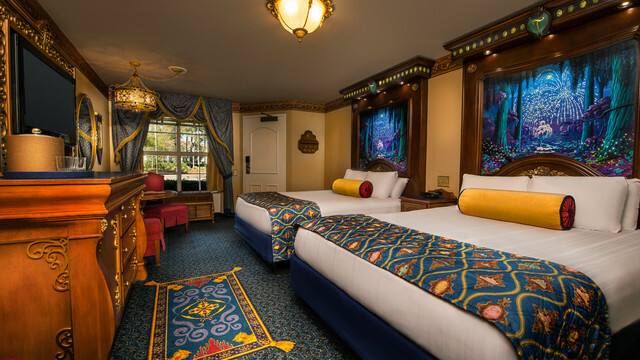 We talk about all the options available at Walt Disney World that are worthy of that royalty you know! Where should a princess stay? What should a princess eat? What should a princess see? We cover it all! And don’t forget to rate us on iTunes! We’d love to know how much you like our show! Last week we planned out what a perfect day would look like at Disney World’s Magic Kingdom for a pirate fan. This week let’s talk about princesses! For a truly special princess day, the little ones must dress the part. 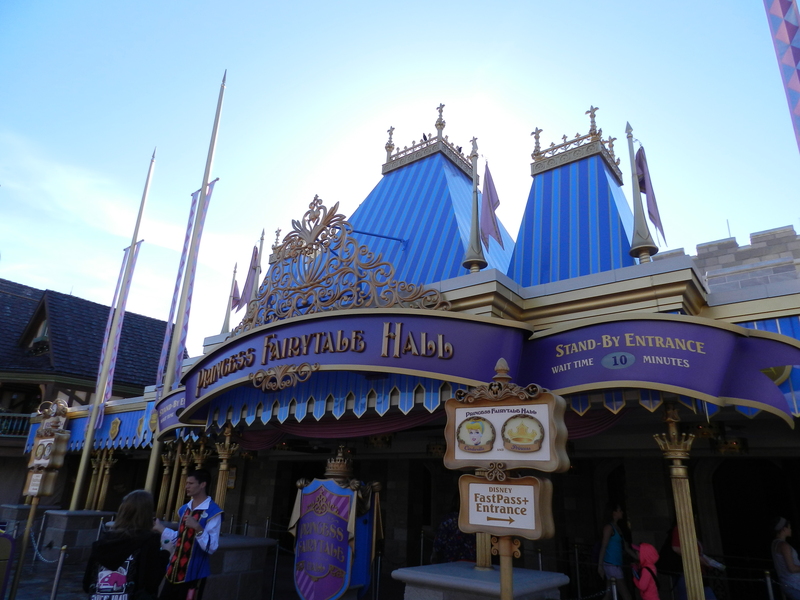 I suggest an early morning appointment at the Bibbidi Bobbidi Boutique located where else, in Cinderella’s Castle! Princesses can choose from The Crown Package (starting at $59.95) which includes hairstyling, shimmering make-up, a face gem, princess sash and tote and nail polish all the way up to the The Castle Package (starting at $194.95) which includes everything in the Crown package plus a costume and accessories and five printed photos! There is even a package for small princes, the $19.95 Knight package featuring hairstyling with gel and a sword and shield. 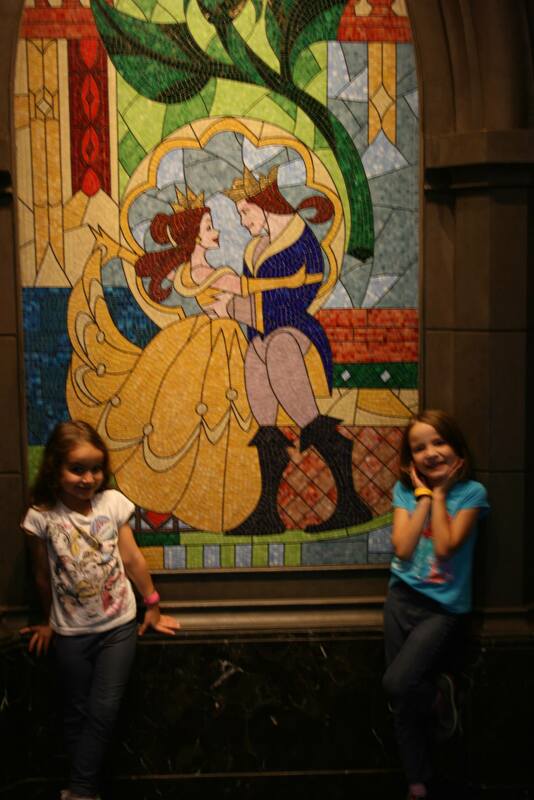 After Bibbidi Bobbidi Boutique, head to Enchanted Tales with Belle where you can become part of the story. 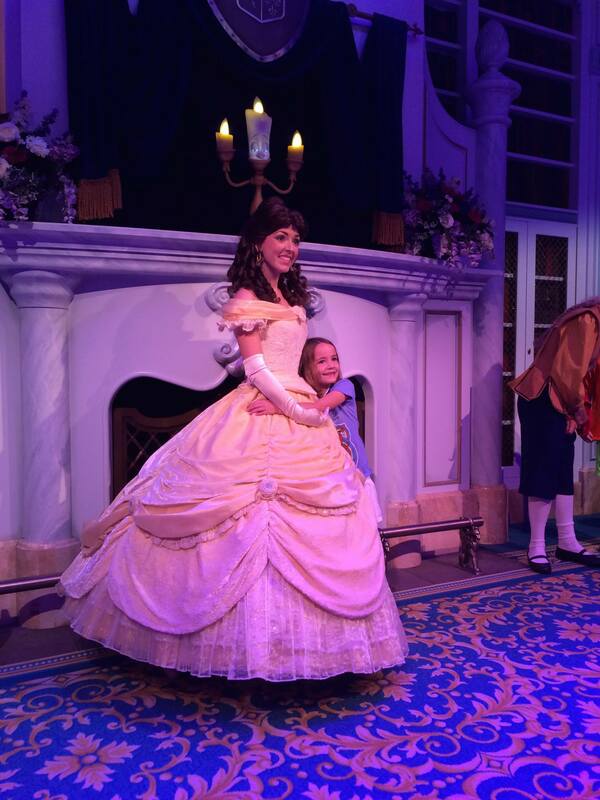 Belle asks for helpers to join her in acting out her story, so go be part of the fun! After the play, the little actors and actresses have a chance to meet with Belle. After a busy morning, princesses are probably getting hungry! Hopefully you (with the help of a travel agent, perhaps!) have secured an advanced dining reservation at Cinderella’s Royal Table. 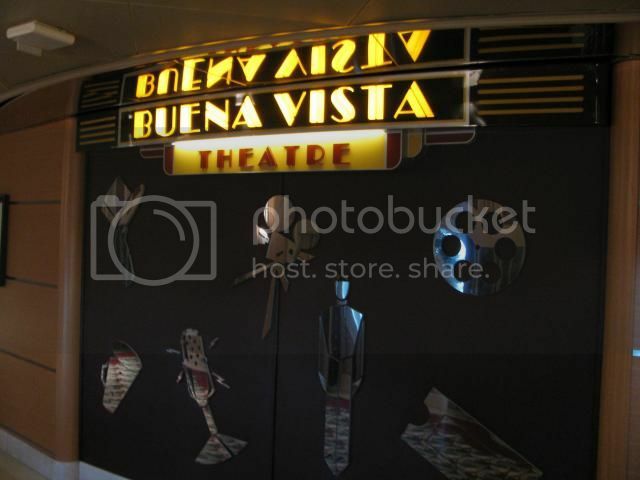 One of the most popular (if not the most popular) dining establishment at Disney World, advance reservations are imperative. 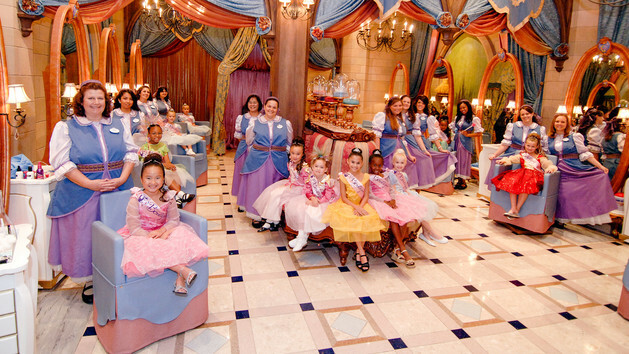 Dining with the Disney princesses is such a special experience for any princess, big or small! Princesses are subject to change but have featured Cinderella (of course! 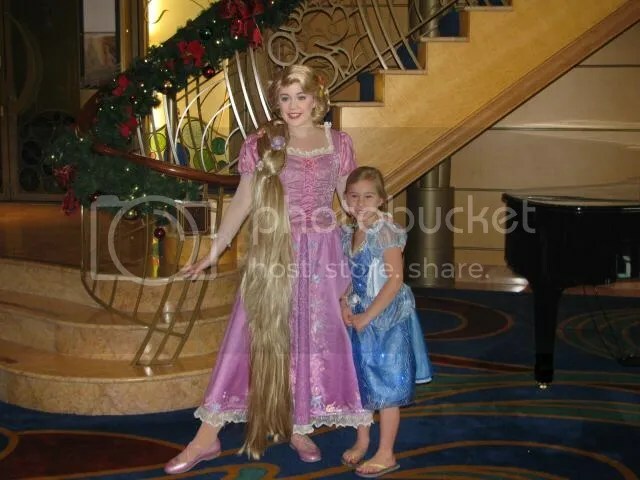 you even have your photo taken with her before the meal), Ariel, Snow White, Aurora, Belle and more. 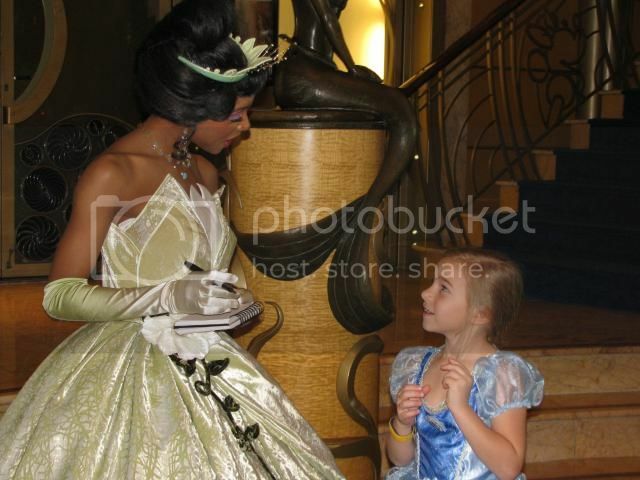 Be sure to check out the Times Guide, since not all of the princesses meet all day long. Lastly, don’t forget to meet Ariel in her grotto, then check out her Under the Sea ~ Journey of the Little Mermaid ride! After all those character meets you may be ready for dinner. 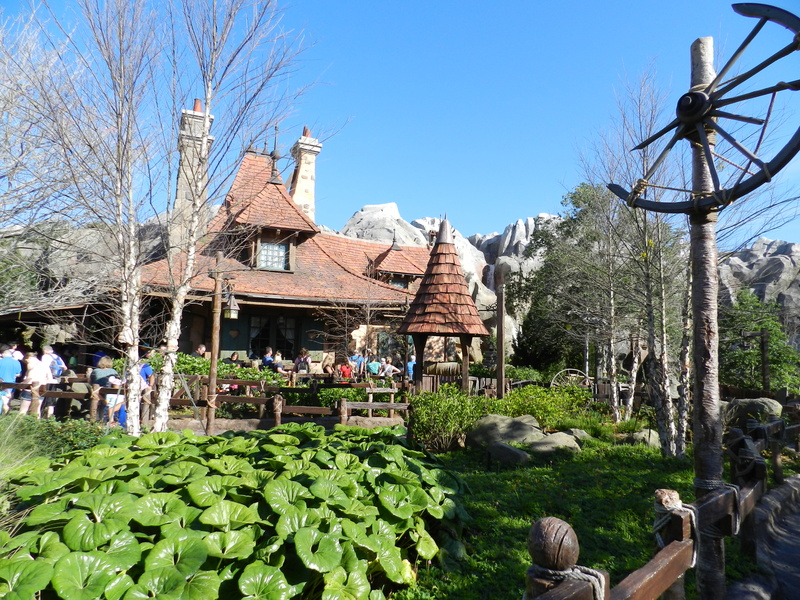 Our suggestion is Be Our Guest restaurant. No, you can’t meet Belle here, but the setting is absolutely fit for a princess and the food is delicious! This morning we woke up and were ready for a full day at sea! The first order of business was breakfast at Beach Blanket Buffet! 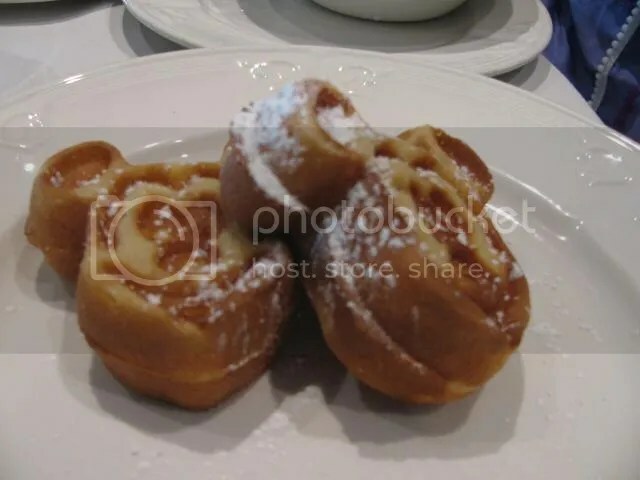 We all had a bit of everything, the clear favorite was the Mickey Waffles! I really enjoy the chocolate croissants and fresh fruit! We went to the Lobby Atrium to meet some princesses next! We were a little early for our ticketed meet and greet so we went to meet Cinderella first. She quite enjoyed Petra’s dress as it lit up when she turned. After this meet we saw Rapunzel, Ariel, Tiana and Belle. 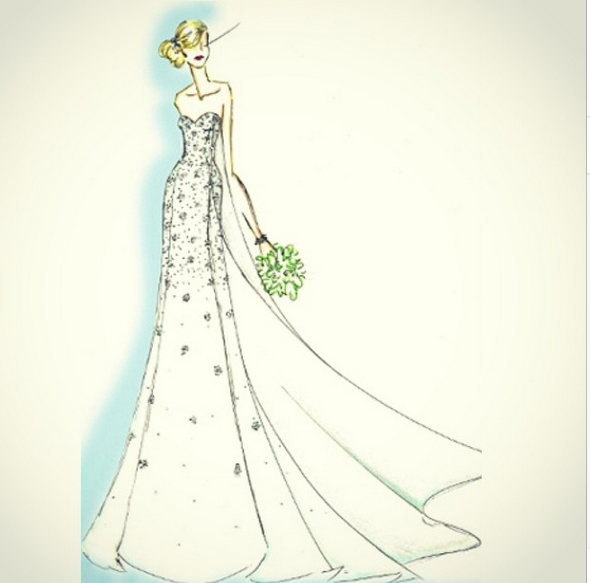 They all adored the dress and asked if she had a Fairy Godmother who made it. 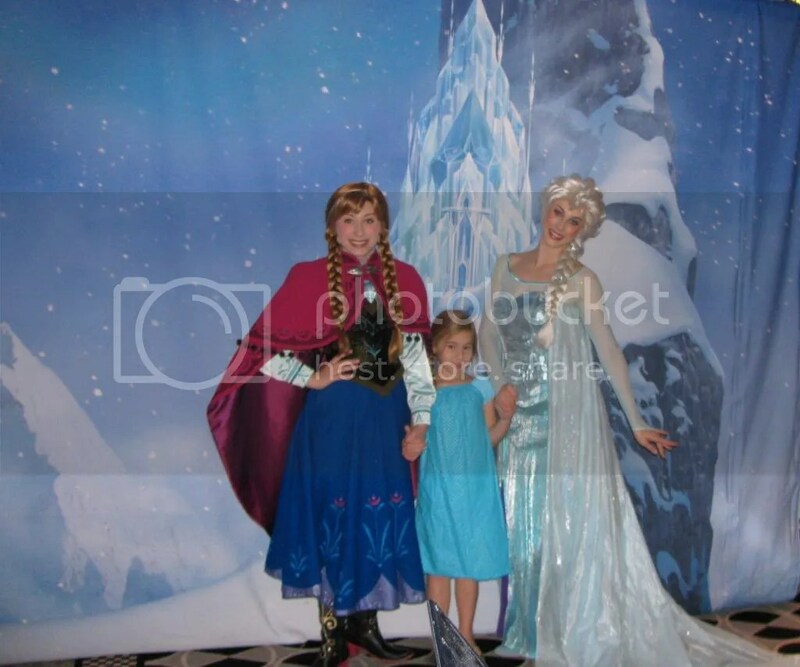 After a quick wardrobe change we headed to our next meet and greet with Anna and Elsa from Frozen. I knew this one would be a hit with her because whose kid isn’t obsessed with Frozen still? While we waited in line they had us sit at a table and color so the line didn’t get too long. Meeting princesses is fun and all but it was time for a swim. My daughter and husband hit up the pool while I went to the Buena Vista Theatre to see Big Hero 6! When the movie was done my daughter was in the club and it was lunch time. We decided to check out Triton’s. I had the gingered-infused carrot soup, glazed meatloaf and key lime pie. Chelsey had the assorted sea food sampler, turkey melt sandwich, and the key lime pie as well. I have no idea what my daughter ate because she ate in the club which actually led to her trying new things! 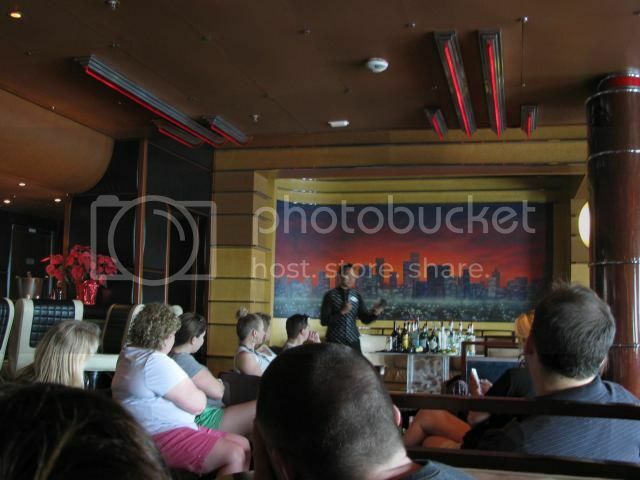 At this point we signed up for a Mixology class! The cost is $15 per person but you get 5 drinks to try while you learn some mixing techniques and drink recipes! Petra wasn’t tired of swimming just yet so we went again but this time to the Goofy Pool. 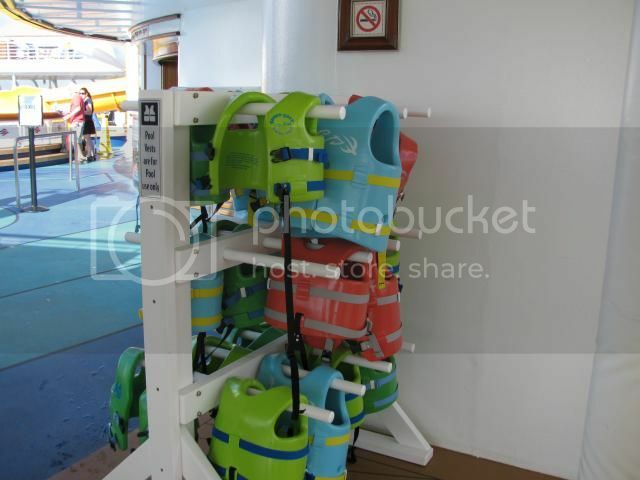 It was really nice that Disney has swim vests so you can save the room in your suitcase! I particularly love how you can watch a movie while you swim around too, Teen Beach Movie happened to be on this time. Of course since we were so close we had to stop for ice cream and fruit! 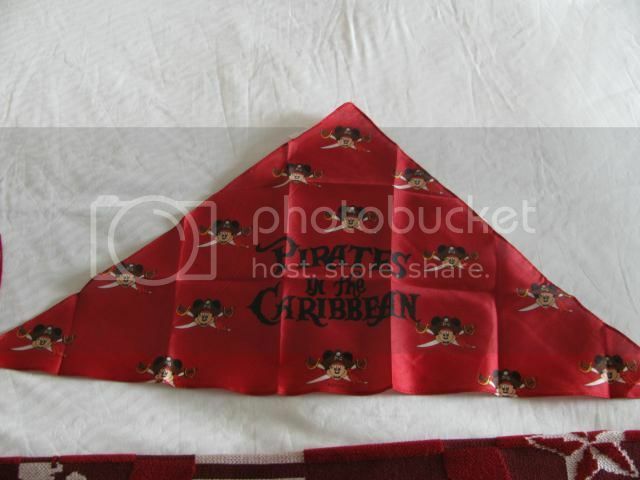 This night was Pirates in the Caribbean so when we arrived in our room we had some bandannas and chocolate coins waiting for us. Dinner this night was not my favorite. The food just wasn’t good and we left with a feeling of meh. To eat I had Pirate’s golden pot stickers, Dutchman’s Dijon crusted sirloin of beef, and the sweet temptations sampler. My daughter enjoyed the macaroni and cheese with fries and broccoli. My husband it looks like he had a crab cake and some steak. Sorry about the lack of notes, but he too found the food lacking. When dinner was done we went up to Deck 9 to check out the activities there. They were doing the challenge of Davy Jones, an interactive video game on the big screen. We played for a while before checking out the arcade. 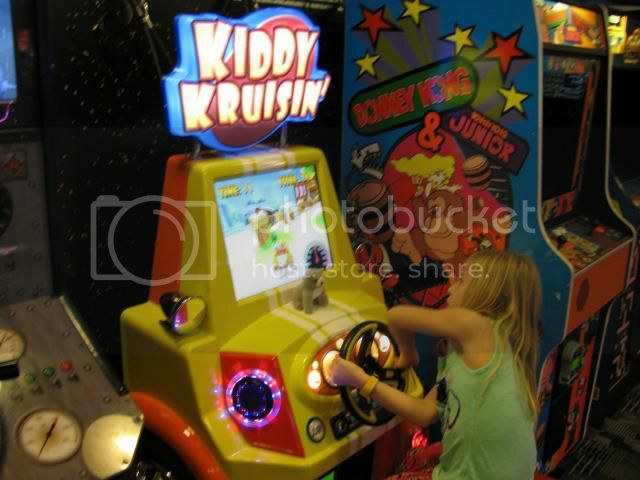 It is a smallish arcade, but it is fun if you want something else to do. The pirate party was starting complete with visits from many of the Disney characters. 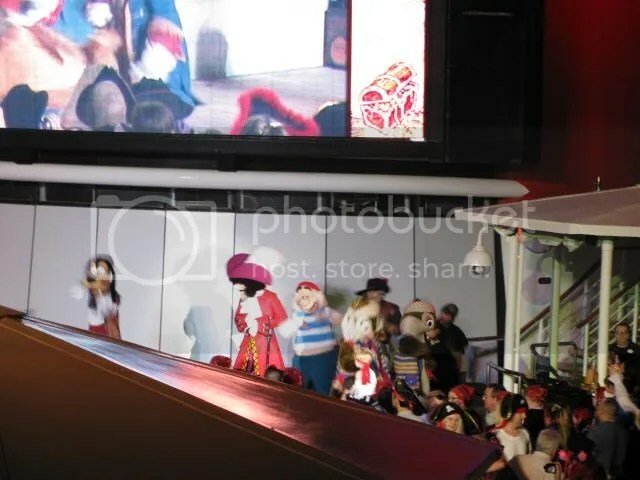 Is was pretty neat to see the type of show they put on complete with pirates coming down on ropes and Mickey flying over the deck to defeat Captain Hook! We watched fireworks (how awesome is that!) from Deck 10 before calling it a night. 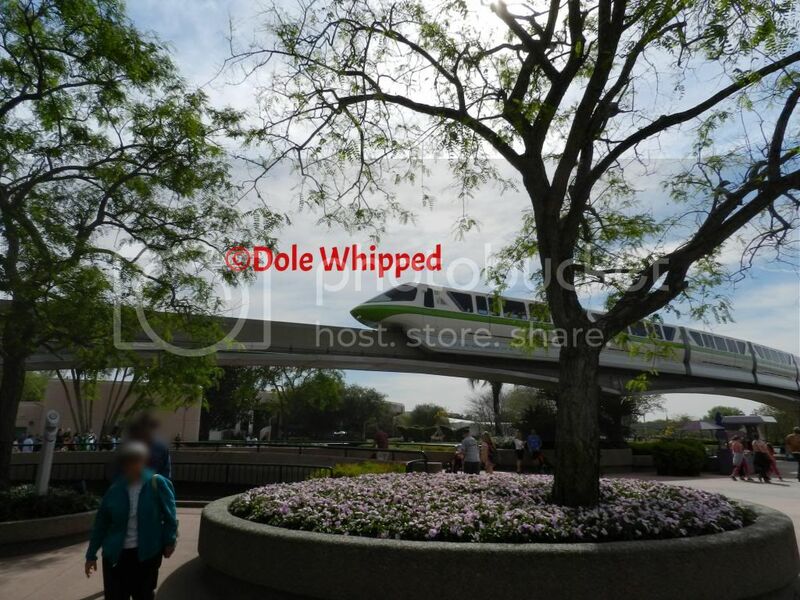 The Dole Whipped girls discuss the last park in the over/underrated series, Magic Kingdom! 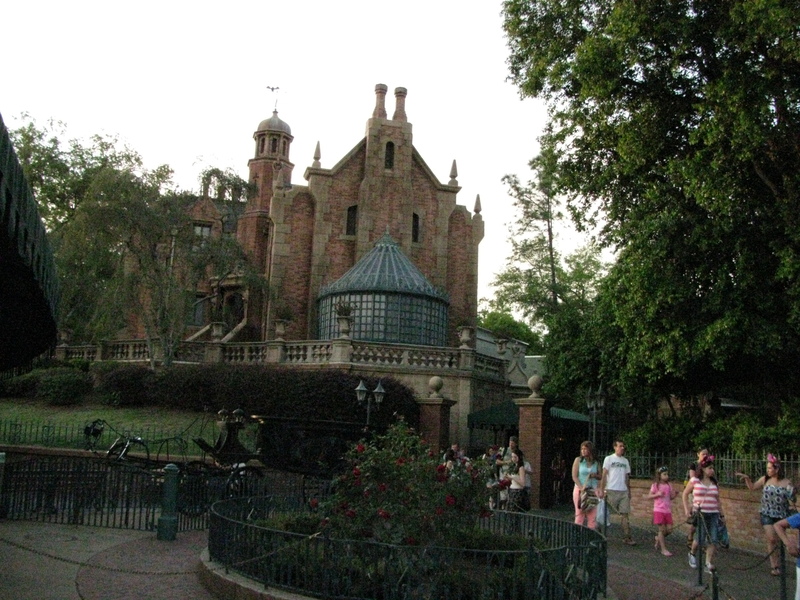 Find out which attractions we love but might not choose to Fast Pass. 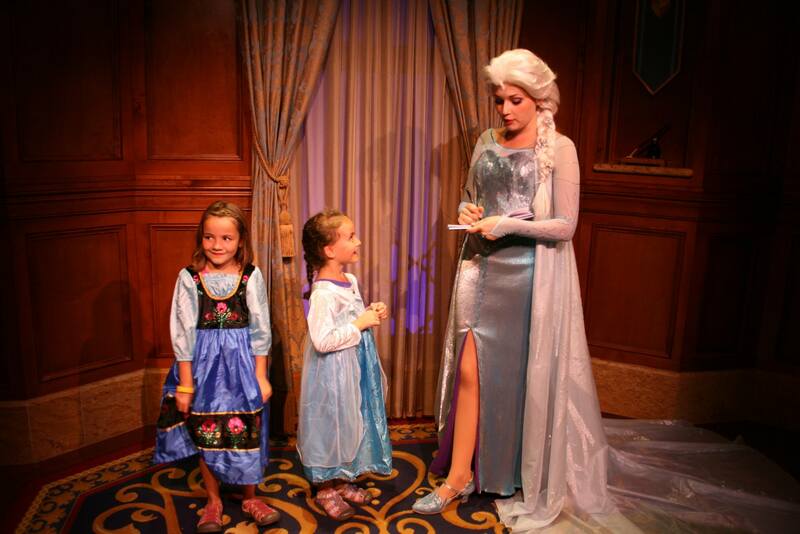 We also give our opinion on the Anna and Elsa meet and greet so you don’t want to miss it! On March 9th, 2014 Disney debuted a brand new parade, the Festival of Fantasy Parade in the Magic Kingdom at Walt Disney World. The parade starts at 3:00pm in Frontierland and ends near the Fire Hall on Main Street USA, taking a path through Liberty Square, around the Hub and down Main Street USA. I found a spot near the train station towards the end of the parade route which means the parade didn’t get to my location until closer to 3:20pm. There are plenty of great places to see the parade, it will be less crowded in Frontierland and Liberty Square as well as near the train station. The busiest places to watch will be near the Hub (the circular area near Cinderella castle) and all down Main Street USA. If you want to get a prime viewing spot make sure you are in a spot about a half hour before the parade or earlier if you plan to be at the Hub. But what is the parade all about? 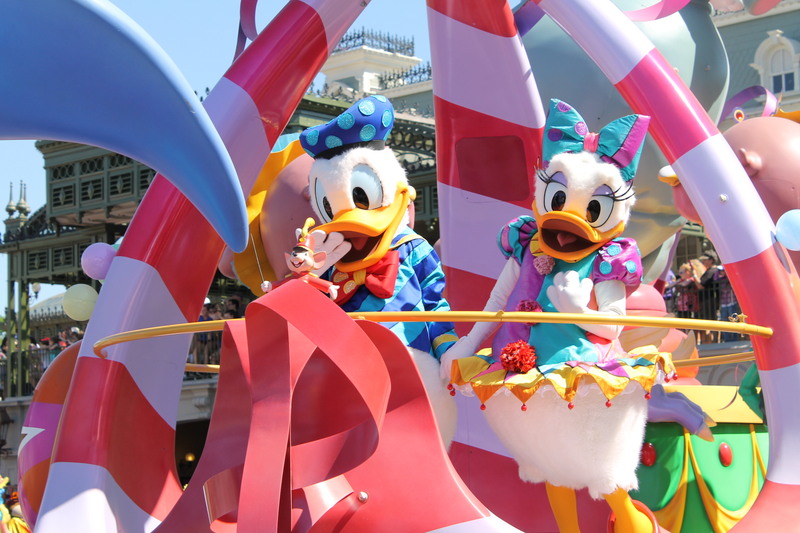 According to Disney’s website “Celebrate the stories you know and love in a whole new way with a magical mix of innovative floats, vibrant costumes and original music. Paying homage to the unbridled magic and vivid pageantry of Fantasyland and its many inhabitants.” This parade is really living up to its hype. It is colorful, vibrant, high energy, and visual appealing. The costumes are amazing, the floats are gorgeous and the music is perfect for the parade. 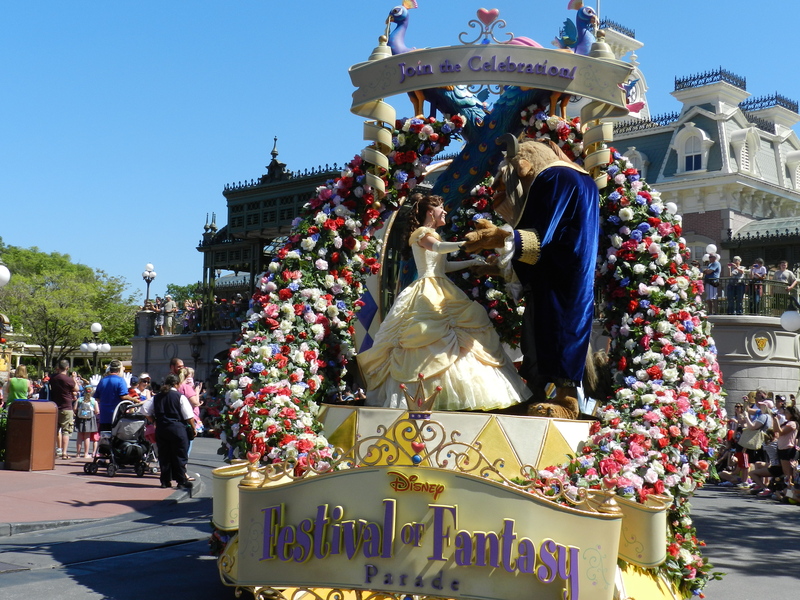 The floats feature first, Belle and the Beast along with Cinderella and Prince Charming, Tiana and Naveen, Anna and Elsa. Next is Rapunzel with Flynn Rider and some of the patrons of the Ugly Duckling, swinging their way down the parade path. Ariel follows next in her clamshell. 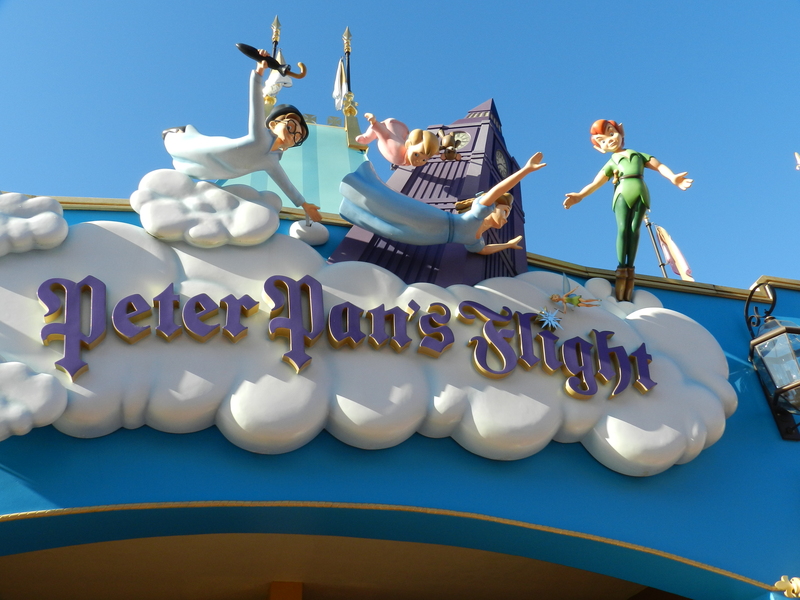 After Ariel is my personal favorite, Peter Pan. Peter Pan and Wendy are in a ship perched on a rainbow held up by skull rock. Underneath the rainbow is Captain Hook on an anchor, followed by Tinker Bell on the back of the float. That float is followed by the Tick Tock Croc. Next we see Merida riding a set of bagpipes and accompanied by some kilted lasses and laddies. The most talked about float is next Maleficent as the Dragon. The dragon breathes fire and is distinctly steampunk inspired. This is accompanied by Prince Phillip fighting the thorns and the three fairies. Snow white and her dwarves follow the dragon on foot. 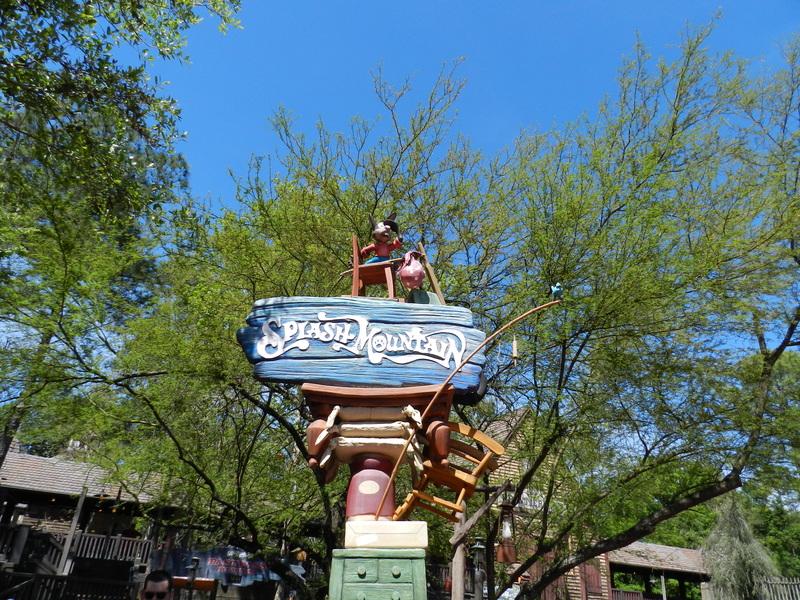 The last large float is Pinocchio, Donald and Daisy Duck, Pluto, and Goofy. And of course in the last float a hot air balloon is the big cheese himself, Mickey Mouse with Minnie Mouse. This parade is a must do! If you don’t normally watch the parade you might want to change your mind. This will appeal to kids of all ages and of course adults too.